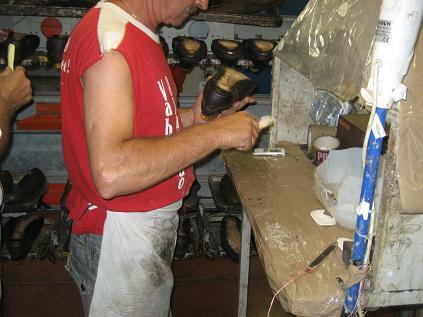 Fashion Footwear production is currently mainly handcrafted. Some manufacturing processes are assisted by specialized machinery (last manufacture, cementing, and cutting) and there exist highly automated lines in mass production of technical shoes (i.e. safety footwear). But most production is still handmade, being especially true in the case of high added value shoes production, where Europe maintains its leadership. Models: every year a minimum of two different collections (summer & winter) of shoes, sandals, boots, etc. are developed to be presented to the customers. As an average, more than 200 different models are manufactured for the two seasons. Sizes: It is necessary to adapt each model in at least six different sizes and two sides (left and right). Materials colours: Each model can be manufactured in different leather qualities and for each quality in different colours. 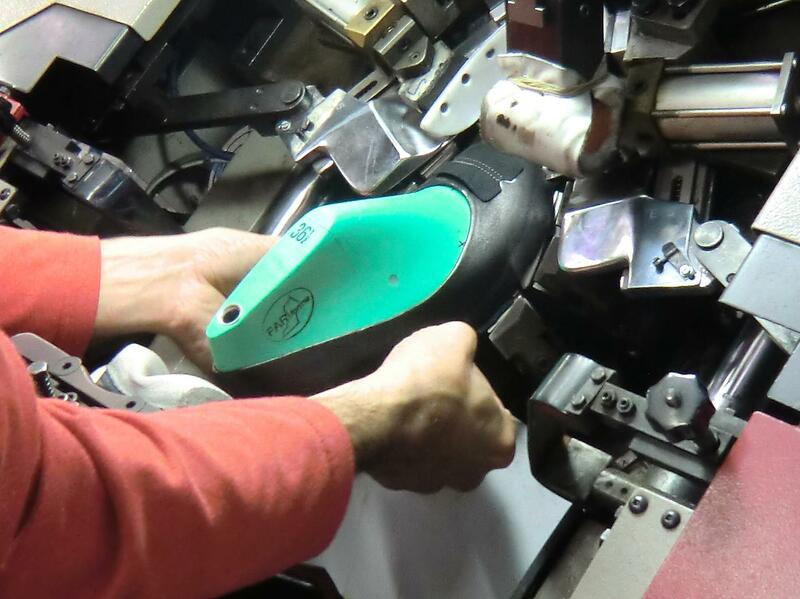 Complex manufacturing process, for each model it is necessary to develop and manufacture the last (the rough form of a human foot used in shoemaking to provide the fit and style of a shoe ), to produce the list of components (sole, heel, sock, strap, inner parts, etc. ), to cut the inner and outside parts, to stitch inner and outside parts. Complex assembly process. The assembly process is very laborious (up to 25 different operations) and especially complex in fitting operations due to the non uniformity and the different elasticity of the natural leather as well as the non-rigid nature of the components that difficult their manipulation. Finally each pair of shoes requires a final inspection (small spots or colour differences in the leather, correct alignment of pieces over the last, etc.) and to finish the packaging that requires the introduction in the shoe of a piece silk paper adjusted with a fitted stick and the final introduction into the box with additional pieces of paper sheets. 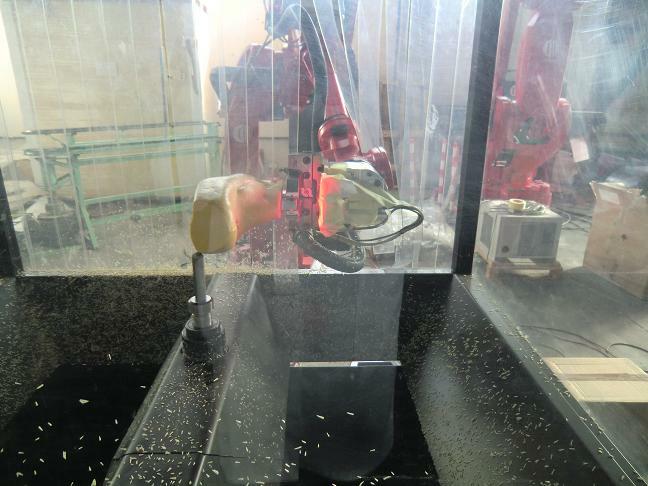 Although some companies in this sector tried in the past to incorporate robotic solutions, they did not succeed in the objective except for specific operations related to the injection process, as stated before. 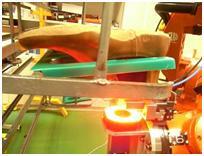 ROBOFOOT is developing different solutions to facilitate the introduction of robotics in traditional footwear industry. To achieve this general objective the 10 partners that compound the ROBOFOOT Consortium have identified the main requirements and selected those operations that have higher impact in the companies. Quality: introduction of robots shouldn´t increase the shoes that need some kind of retouching at the end of the line (currently an average of 80%). On the contrary, as most of these small faults are due to the low stability of some processes it is expected that the use of robots will contribute to reduce these retouching operations. Impact in current production process: A basic requirement is the possibility to combine current production procedures with the robotized solutions proposed by ROBOFOOT. 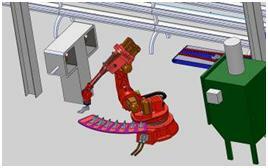 This includes the coexistence of manual operations with robotized ones and the reuse of current production means. Efficiency: reduction of manufacturing time. It should be taken into account that the robotized production has to be integrated in the production line where ‘traditional’ production means coexist. So, reduction of individual operation time cannot be considered an objective unless we consider this reduction the foundation for combining two operations. Production flexibility. ROBOFOOT has to guarantee the production flexibility, handling a wide variety of models/sizes coexisting in the production line and allowing frequent model changes. Reduction of costs. Although it is not the main reason for introduction of robotics in this sector, it will allow some workers to do tasks with higher added value and overcome the lack of skilled workers for some operations. Working conditions. Currently there are several operations that involve potential risk for workers (dust, solvents, rotating parts, effort...). 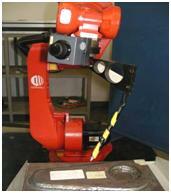 Introducing robots has to help in reducing the potential risk of those operations to the minimum. Usability and maintainability. The system has to be easy to use and maintain by no specialists. Has it a positive impact in initial requirements? Does it mean an innovation in the process? Is the operation applied in most shoe types? Are there many variants in the way of doing the process? Can we cope with most of them? Is the solution proposed suitable to be used in other operations? Does it seem feasible to be done in the timeframe of the project? Is it suitable to be introduced in a demonstrator? Basic prototype. 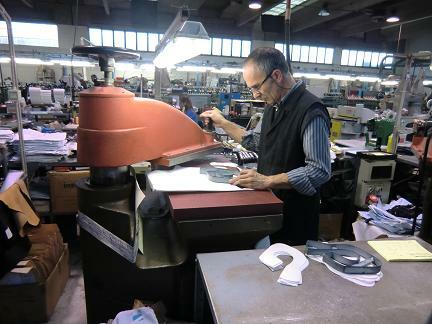 It includes individual operations: Roughing, Gluing, Inking, Polishing, Last Manufacturing. Intermediate prototype. They correspond to some operations that can be combined in the same robotic cell: Roughing+ Gluing; Inking+ polishing+ last removal. 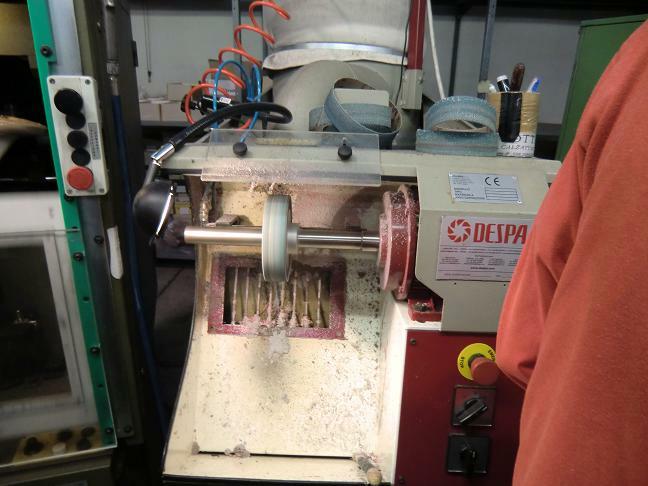 Inspection will be included as well to detect the presence of nails, assess the gluing and roughing processes and identify surface defects on the shoe. Final prototype: It corresponds to the most challenging operation, i.e. packaging. A complete robotized cell has been designed, although only some of the sub-operations will be implemented in the context of ROBOFOOT. 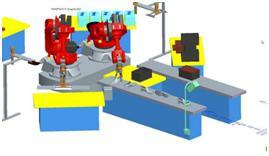 Automatic robot part program generation from digital data. 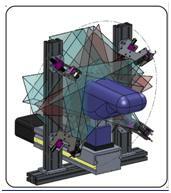 A CAD/CAM system is developed to define the tool-path that has to be followed by the robot as well as the process parameters. The geometry is imported from the virtual model or from a digitalized model. 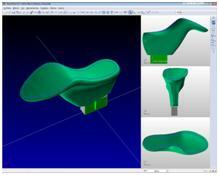 Based on that, the user can define the area to be processed and the parameters to be used. After the post-processing of the resulting file, the program executable by the robot is generated. However even a small assembly error between the GD and the last may lead to a significant difference between the theoretical and real tool trajectory – especially at shoe tip. To overcome this problem it will be developed a system for online adaptation of off-line robot program. CNR-ITIA – is developing an innovative solution for on-line smart adaptation of off-line automatic robot part program generated from digital data (CAD/CAM) through the use of on-line sensors namely a new generation of modular, scalable and reconfigurable 3D laser scanners. To this aim, a 3D laser scanning device has been conceived and developed to fine-tune the program generated in the previous step by adding the real positioning of the GD with respect the Last. 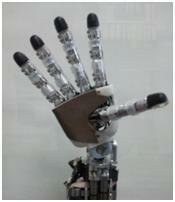 It represents an innovative and smart way to program robot movements in an intuitive way at a very low cost. The design of the device is such that it is made out of low-cost parts, without losing focus on the performance of the system. The device will allow operators (even unskilled ones) to save time during the robot movement programming, without losing the quality of the trajectory definition. 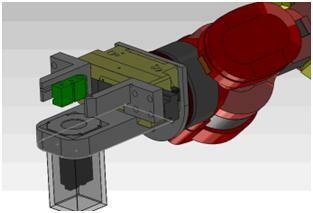 The device is extremely flexible as it can be positioned on the robot tool (or mounted on the robot flange) regardless of the robot type. Finally, we have to consider that for some operations it is needed to correct or generate the trajectory of the robot in real time. 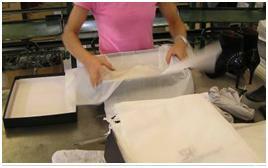 This is the case of operations like roughing, where it is important to guarantee that the leather is not damaged. 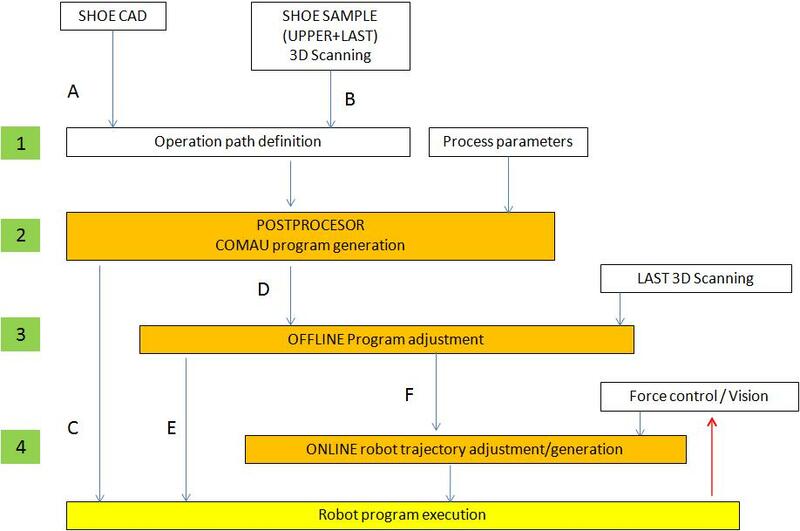 ROBOFOOT will provide a real time robot trajectory adaptation mechanism based on force control and using the C4G Open feature that allows the possibility to change several parameters on-line (robot system variables). On the other hand, visual servoing control is developed to identify the pose of the shoes in the manovia and generate the robot trajectory to pick them up. To this aim, a vision system in an eye-in-hand configuration has been introduced. ROBOFOOT considers two different problems: manipulation with the Last and manipulation without Last, just the shoe. In the first case it has been necessary to modify the current lasts by introducing an external element, the Grasping Device (GD) that allows grasping the last with the required rigidity and repeatability. This modification has been done in such a way that lasts can be compatible with existing manufacturing machines at end-users facilities. The vision system makes possible the identification of the pose of the lasts both on the manovia and when they lie on the exit of a chiller. 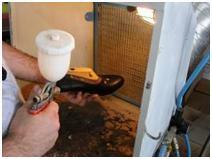 In the second scenario (shoes without lasts) the deployment of a simple parallel gripper would damage the shoe and special grippers (for instance suction) would only be helpful for some shoe types and materials. Here it is where the use of a dexterous multifinger hand finds its application niche.